I love creating balloon sculptures - from quick one balloon creations for long lines, individual treasures for party goers, or elaborate multiballoon creations for entertainment and/or decoration. My passion is to present gospel messages using balloons. Also, I can create balloon arrangements (floral or sculpture) for delivery (as a clown or not) with a song or sentiment. Contact me so we can talk about your desire. 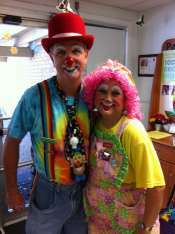 FOR MORE PICTURES CHECK OUT CHARITY THE CLOWN ON FACEBOOK. Click on any of the thumbnails to get a larger photo with detailed information. Click on an entry to see the large photo with details. Images found in this portfolio may not be copied without permission from the owner of the photo. Balloon artist portfolio pages hosted by BalloonHQ.com.